A dozen women in black headscarves washed Ladan and Laleh Bijani's bodies and tenderly wrapped them in long strips of white cotton in preparation Wednesday for the flight home to Iran. The 29-year-olds, who were born joined at the head, knew no one in Singapore when they arrived more than seven months ago, chasing a dream of living separate lives - one as a lawyer, the other a journalist. But hundreds mourned as their bodies were prepared to be sent back to Tehran early Thursday in separate caskets. The twins sought out the risky surgery at a hospital in this city state because a doctor here had successfully separated 18-month-old Nepalese twins in 2001. The Bijanis' operation - the first attempt to separate adult conjoined twins - went awry Tuesday shortly after surgeons finished separating their heads. The courage and optimism the twins showed as they went into surgery captured the hearts of people around the world, and their deaths Tuesday triggered an outpouring of grief. Muslim nurses, who befriended the Bijanis during months of preoperative tests, helped women from Singapore's Iranian community purify the bodies for the 4,000-mile voyage back to their birth family in Iran. Their heads were wrapped first, then right sides and then their left - the women wound the wide strips from their shoulders to their feet - in accordance with Shiite Muslim tradition. Afterward, the women draped a brown-and-gold batik funeral shroud over Laleh's body and a black-and-white shroud over Ladan's. Bahar Niko, 24, who became the twins' confidante in Singapore, pushed her way through the 60 men gathered in the main room of the Islamic school house and knelt between bodies. Putting a hand on each sister's body, she wept. "God is great," said the imam, Mohammed Rosli Hassan, his voice choked with emotion before the men lifted the bodies into two plain brown coffins. 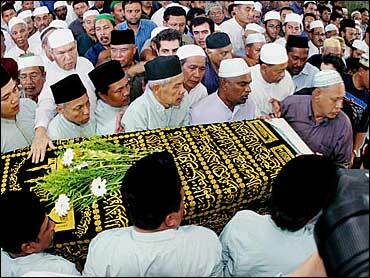 A copy of the Quran, the Muslim holy book, was placed in each coffin. Some wailed as a man nailed the caskets shut. "I can't describe the grief," said Mehran Ghadirian, who became a friend to the twins before the surgery. More than 400 people later gathered in a Singapore mosque at dusk to pray over the caskets, each adorned with a single white geranium. Dozens of wreaths sent by well-wishers piled up at the mosque's entrance as other mourners, include five Buddhist monks, a priest and two nuns, waited outside. A message on one wreath read: "Separated. May you rest in peace." The twins' bodies were expected to be flown to Tehran early Thursday morning (Wednesday EDT) on a commercial flight, said Hasan al-Attas, a member of Singapore's Iranian community. "I think they were happy they went together," said 14-year-old Elham Komjka. "We are all very sad." A local religious leader, Imam Baragh spoke of how the twins were an example of perseverance, love and courage. People who had met the twins said their zest for life was what made them distinct. together, they could dance, they could play and joke around," Elham Konjkav told CBS News. "That's the fondest memory I have of them." Both of the women knew the operation's high risks but had pressed for surgery out of a deep desire to live separate, ordinary lives. Surgeons in Germany had earlier refused to carry out the procedure, saying it was too dangerous. Both were law graduates, but only Ladan, the more extroverted sister, wanted to become a lawyer. Laleh's love was journalism. "If God wants us to live the rest of our lives as two separate, independent individuals, we will," Ladan said before the operation. In their homeland, Iranians wept as state television announced the deaths of the twins from a poor family who touched the world with their determination to see each other face-to-face, rather than in a mirror. "Is my beloved Ladan really not with us anymore?" Zari, an elder sister, said after hearing in Iran that her sister had died. Seconds later, she fainted. In Singapore, dozens of people, mostly Iranian expatriates, gathered Wednesday for prayers at a Muslim school. They sat cross-legged, chanting verses from the Muslim holy book. A bouquet of white and yellow carnations was placed near the entrance in honor of Ladan and Laleh, who were named after delicate Persian flowers. The twins' operation took more than 50 grueling hours and was carried out by a team of international surgeons. The operation — the first attempt to separate a pair of adult twins born joined at the head — was fraught with difficulties. Previous operations have been on infants, whose brains can recover more easily. Surgeons repeatedly encountered surprises that preoperative tests couldn't detect. The skulls were harder to cut than expected, the twins' distinct brains had fused and their blood pressures were unstable. It was the unpredictable changes in how their blood flowed, and surgeons' inability to cope with those changes, that killed the sisters, lead surgeon Keith Goh said. Over three days, the team of 28 doctors and about 100 medical assistants worked in the tight space surrounding the twins, who were braced in a sitting position. Surrounded by a dozen nurses and technicians, surgeons stood Tuesday on either side of the sisters, cradling their heads to support them as the final cut was made. The blood started flowing uncontrollably the instant the surgeon cut through the point where the bottom of the brain touched the bone. Most ethicists thought the operation was justified.